I’m super pleased that Kieran has been awarded the 2013 Lofty Award in Alice Springs at Watch This Space artist run initiative. She has been an important arts writer in Central Australia, giving the whole scene such a considered and careful focus. Below is the article she wrote about The Long Weekend in Alice Springs in May of 2013 – the original can be read here. You can see here an example of her poetic criticism which is constructive and positive in a manner which is rare in arts writing. The cover of The Long Weekend in Alice Springs suggests that the story between its covers will be road trip. And it is one, of sorts. You won’t find these roads on any map but they will lead you into the byways of this desert place, reaching back through history into stories of origin, reaching out through darkness, real and metaphoric, into stories of now. The starting points are several, all at once. There’s the meeting of Joshua Santospirito and Craig San Roque, a young man and an older man, one a psychiatric nurse with a drawing gift, the other a psychologist with a lyric gift. There’s a campfire and in its flickering light, a woman in mourning. Her husband has died but her grief goes deeper than this. There’s a book of quite a different order, Jungian explorations of the contemporary world, and a request for San Roque to make a contribution. So, setting out from the meeting of the two men, for the sake of simplicity in this text, with its limited means of typed words on a screen, destined for a journalism site. These are limits that The Long Weekend is marvellously liberated from, due to its form as a ‘graphic novel’ or ‘comic’ (words that don’t quite rightly describe it); due to Santospirito’s artistry; due to the soaring and delving of San Roque’s mind and pen. Santospirito, frustrated and raw from his experience of working in remote mental health, met San Roque, seasoned by long years of the same, but also resilient from a deep nourishment – as we learn from his essay at the end of the book – by Jungian psychoanalysis, thought and practice. San Roque gave Santospirito some of his writings, including an essay, ‘A Long Weekend in Alice Springs’, his contribution to The Cultural Complex: Contemporary Jungian Perspectives on Psyche and Society, edited by Thomas Singer and Samuel L. Kimbles (Brunner-Routledge, 2004). There was no sudden illumination that explained everything or showed a way forward but Santospirito found the writings “somehow useful” and began to draw his way into San Roque’s ‘Long Weekend’. He takes us to the campfire in San Roque’s backyard and in just a few deft black and white images envelopes us in the thickness of this night, the deep well of loss that has brought Manka Maru to this point, by this fire. He draws ‘Craig’ at his desk, wrestling with the task of writing an Australian perspective for The Cultural Complex, wrestling with the very concept of how a cultural complex operates – easier to detect looking at another culture, harder to detect in your own culture. Craig’s door opens into the backyard. It’s Friday and Warlpiri family from the bush join Manka Maru. They’ve come in for the footy match; among them, a young man damaged by petrol sniffing, one of many in Craig’s professional care. The visitors interrupt Craig’s concentration but it’s a fruitful interruption: he will find his way into thinking about cultural complexes by describing what happens on this long weekend. Some of what happens is eventful in a road trip kind of way – like going hunting with the Warlpiri visitors who arrive in increasing number. Some of it is eventful but bleak as Craig, the ‘shrink’, goes about his work, in the court, at the hospital, by the roadside where a man, who believes he is the King of Iraq, is sitting in his car with his three-day dead dog on the back seat. This episode kick starts the deeper journey, a haunting, at times thrilling excursion into our psychological inheritances. Is the ‘King of Iraq’ a refugee from another time, Craig asks himself. And his mind wanders to the mythical Middle East and the story of Inanna’s grasping, ruthless attempt to bargain with death. (Santospirito’s drawing and mise en scene make the story wonderfully vivid.) The cure for some our ills would be an “assurance of immortality”. It’s part of what Craig knows the King needs. But short of that, what? Cultural memory offers resilience in face of the tides of history. Craig picks up a male friend, Amos, to join him on the hunting trip with the Warlpiri women and children. Amos is of middle European and Jewish lineage – a strong bloodline in dispossession. 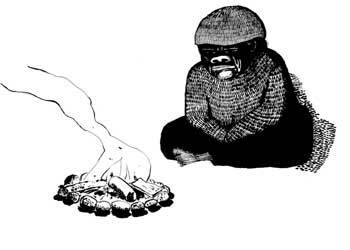 Around the campfire, cooking lizards, Napaltjarri tells the children, black and white, about the travels of Malu (kangaroo) from up North. Amos and Craig sit to the side – Craig’s still wrestling with his writing task and enlists Amos’ help. They try tracing some travels of their own, the big shifts of people from their lands in Europe. Amos suggests that the Gypsies and the Jews were less vulnerable to the cultural breakdown this caused because they’d “learned to use cultural memory in a special nomadic manner”. When memory is encoded in sites and song-cycles, as it is in classical Aboriginal culture, and the links to these are broken, depression and malaise follows. This is affecting (to greater or lesser degrees) all who live in contemporary Alice Springs – not just in the shadow of broken Aboriginal songs, but in the shadow of non-Aboriginal people’s own cultural disconnections as well as the contradictions between the Christian and colonising projects that are the foundation of our nation. If I’ve understood it rightly, cultural complexes get people stuck in this brokenness and this contradictory space. “We can save ourselves with imagination.” It’s the closest thing to a ‘solution’ that can be put between inverted commas. And the book enlists us at every page into acts of imagination through the alchemy of Santospirito’s and San Roque’s gifts. 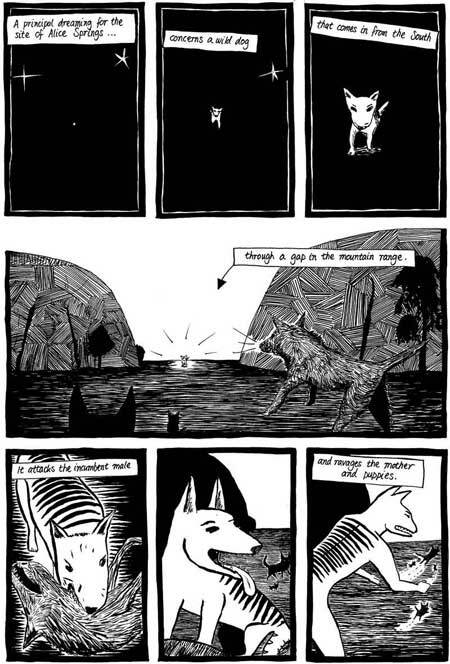 Some of Santospirito’s drawings are exceptional in their emotional power, and the multi-layering through space and time that the comic book form allows makes for rich story-telling. Combine this with San Roque’s poetics, the depth of his thought, and the heart of both men, and you have a book, a travel guide for our place and time. Read it and you’ll never think about the town’s ‘social problems’ in the same away again. Read it and you’ll never look at Alhekulyele (Mount Gillen, the nose of the ancestral dog) in the same way again. 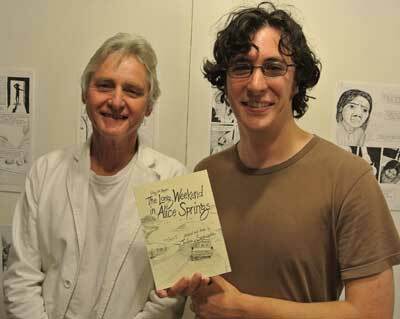 At present, The Long Weekend in Alice Springs is also an exhibition at Watch This Space in George Crescent. It shows the comic book in the making, the drawings that appear in its pages and more, as Santospirito worked on his adaptation. Until June 7.